BM Nissan is the only Showroom in Faridabad dealing in Nissan Cars Sales and Services. 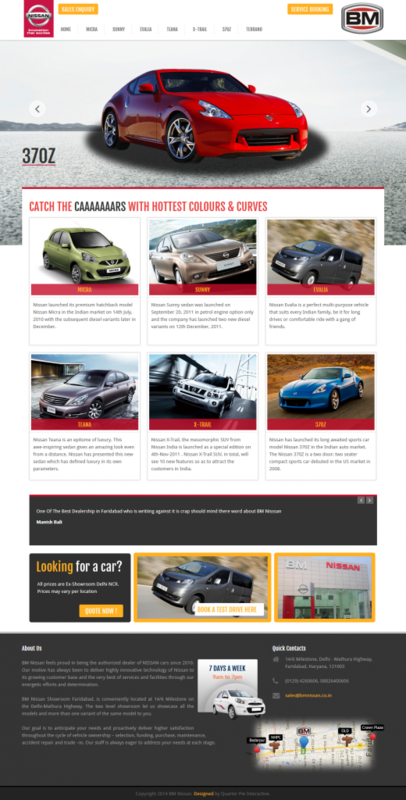 The car showroom website design for BM Nissan is a showcase website for all the Nissan Cars available in India. The website also has a CRM System which is closely integrated with the public interface to send all the queries to BM Nissan Sales Team. The website is based on a Custom Design done exclusively for BM Nissan and has all the brand elements that a Nissan associated website will carry. This displays the brand image and takes advantage of the confidence that a website visitor will have in the brand that is popular for Quality Products and Excellent Customer Service.